A notarisation seal embossed and stamped by a notary public. Notarisation by a Notary Public ensures that a document is authentic, that the signatures on that document are authentic, that the signer was not forced to sign the document, and that the document’s terms are in full force and effect. A Notary Public’s main duty is to screen and verify the signer’s identity, willingness, and awareness to sign the document, which helps to detect and deter document fraud, as well as coerced and incompetent signings of documents. This process was designed to help lighten the load of the court system and solidify the network of trust. After notarisation, a document can undergo further verification such as an apostille. 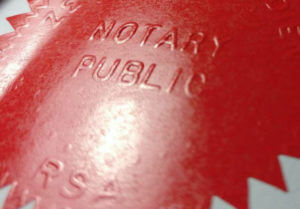 What are the different types of notarial acts or notarisations? There are generally three types of notarisation available and you must make sure which it is that you require. Documents that require acknowledgements generally revolve around the conveying of ownership of assets. These include real estate deals, deeds, powers of attorney and trusts. For an acknowledgment to be notarised, the signer must appear in person before the Notary Public so that his or her willingness to sign and identity can be verified. Jurats are performed on evidentiary documents which form part of the operation of the civil and criminal justice system. These types of documents include affidavits, depositions, and interrogatories. Before a Jurat can be delivered, the signer must appear in person before the Notary Public for his or her identity to be confirmed as well as their willingness to sign the document. Copy certifications can be done to confirm that a reproduction of an original document is true, complete, and exact. These types of documents include college degrees, passports, and other important personal documents that cannot be certified by public record offices. These types of notarisations are not authorized notarial acts, and in the jurisdictions where they are authorized, may only be executed with certain kinds of original documents. A Notary Public is a commissioned representative of a state government and is charged with verifying your identity as the signatory, which ensures that you sign the document under your own free will and witnessing the signing event. Institutions rely on Notary Publics so that they may have full faith in important documents, such as travel documentation and police clearance certificates. When a Notary Public has witnessed a signing of a document, he or she applies their own details which include their signature, seal, and notary commission details. These stamps and seals serve as a means of verifying the transaction so that others can rely on its authenticity. Because documents that have to be notarised are so important, they mostly have to be signed in the presence of a Notary Public, which can often be frustrating. If you have documents that have to be notarised, you will have to find and make an appointment with a Notary Public before your documents can be authenticated and verified, and only then will you be able to use them for your intended purpose of travel. Contact us for our notary public and notarisation services. See our pricing.